What is so good about Artvalli Canvases? Tip: Artvalli canvases are perfect for acrylic, oil and mixed media. The Artvalli canvas range is a budget canvas range that is great for schools and organisations that need to purchase bulk amounts of canvases. 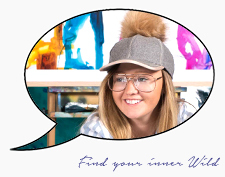 If purchasing canvases in bulk that is box lots, simply contact an Artworx representative and they will organise a purchase order for you and wholesale pricing 03 5229 4677, admin@artworxgeelong.com.au. For a budget canvas the Artvalli line is a step up from discount store canvases like the reject shop, even though they sit in the same price brackets. If you are buying in bulk and working with beginners or students these canvases are perfect and will give them the experience of painting on a professional art supplies canvas. The Artvalli range is available in two different profile edge sizes, the standard thick approximate 30mm size and the approximate 20mm thin frame. The actual canvas is made from 100% cotton duck, which has a tight, weave, the canvas beats like a drum and won’t have the tendency to stretch or relax over time. It is a fairly consistent stretched canvas to paint on being triple primed with titanium white gesso and having a density of 280gsm (4oz). The canvas is also acid free and is stapled at the back of the frame to give a staple free edge. The stretcher bars are made of a nice sturdy pine which is actually a big plus as I haven’t come across any other budget range canvases like this, usually they are made of a lighter type of timer. 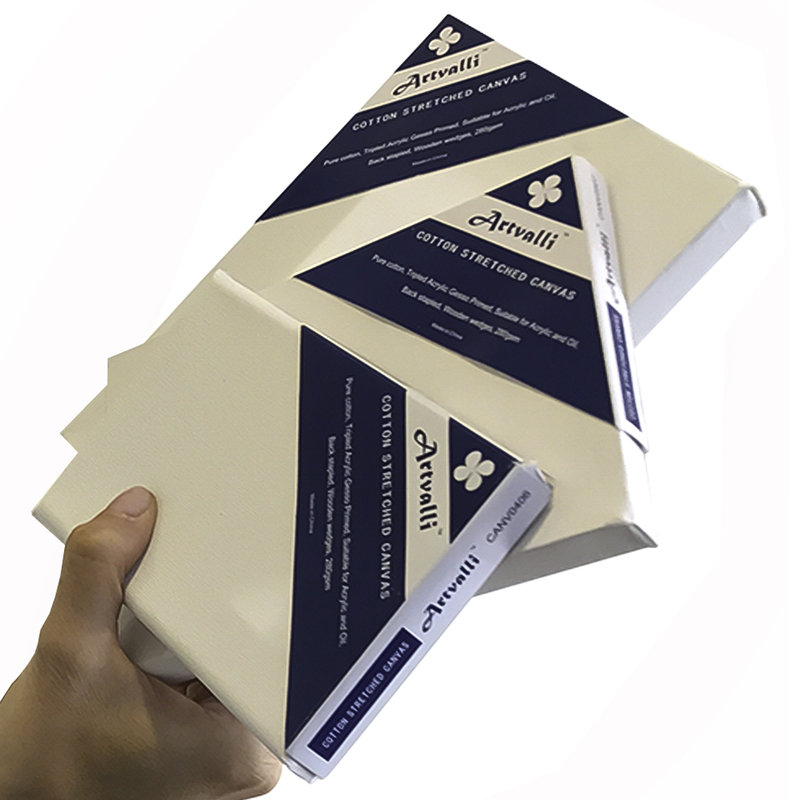 The Artvalli canvas range exists in the art supplies market to offer beginners and students the experience and feel of working on an artist like canvas without the expense. Whether you are buying small canvases in bulk or large ones you can be assured that the quality of these canvases is fairly consistent from one box to the next. In a nutshell Artvalli canvases are cheap canvases that are actually good quality. Canvas sizes range from the ever so popular 5 x 7 canvas to larger frames of 48x71 inches. We love: That we have never seen one of these canvases warp over the past ten years. If however you are chasing a denser 10 oz. 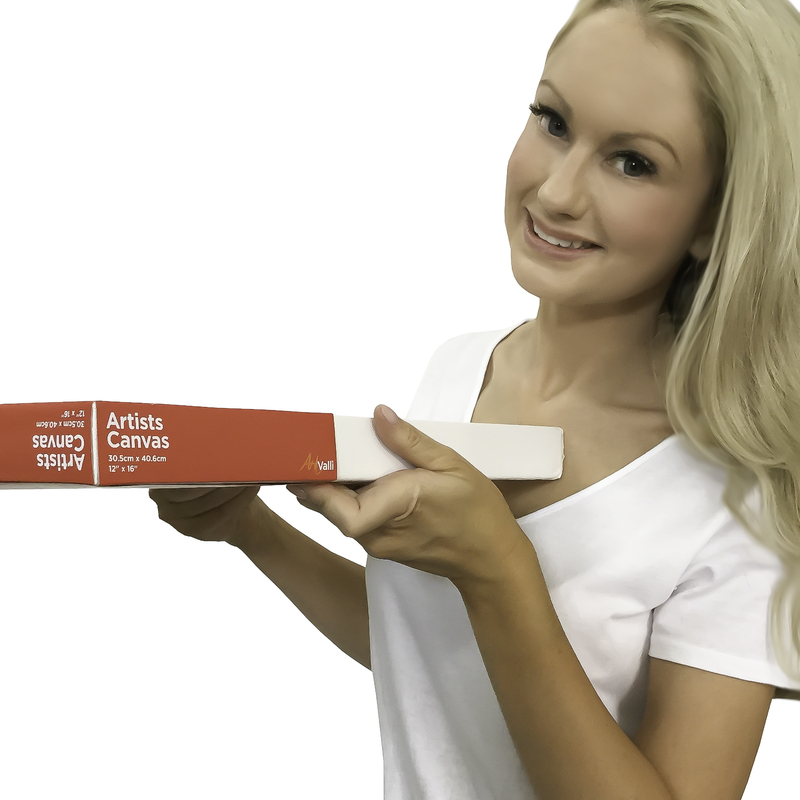 canvas check out the Art Materials Australia Fine Art range another great canvas without the price tag.